Filler metals typically equates a small portion of the cost of a welding operation — but they can have a big impact on productivity and the bottom line. Two factors that have significant influence on filler metal consumption and operational costs (and overall welding productivity) are joint design and welding process. Because many variables influence which filler metals may positively or negatively contribute to profitability, filler metals and the factors influencing their consumption should be looked into throughout the planning and lifespan of any welding job. Project planning is a key part of keeping filler metals from negatively impacting the bottom line. Incorrect estimates for filler metal consumption can have a significant impact on bidding and purchasing. Overestimating filler metal usage can lead to inflated and uncompetitive job bids, and an expensive stockpile of product that may never be used. Conversely, underestimating usage and purchasing too little filler metal can lead to costly delays that may contribute to a project running over budget. 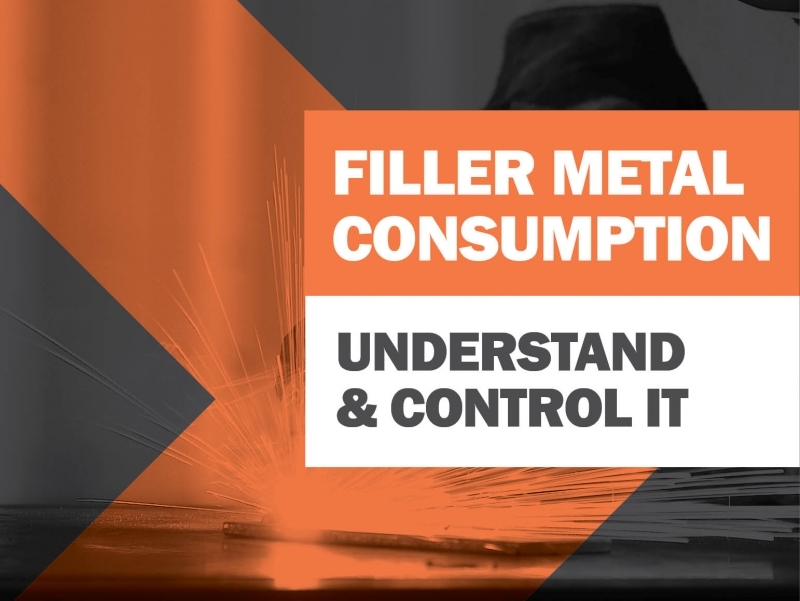 Numerous resources are available to help generate accurate calculations for filler metal consumption. Using project blueprints, a calculator and basic geometry are examples. Online calculators or apps, which are often much faster allow users to input joint details, such as root opening and groove angle, and determine how much filler metal is needed for a length of weld. Whichever method is used, it's important to know that joint design and the welding process directly affects filler metal consumption. The joint design determines how many passes it takes to complete a weld and how much filler metal is needed. Reducing weld cross-sectional area helps reduce filler metal consumption. However, the best joint design is one that balances cost efficiency with the capabilities of the welding process and the filler metal being used to consistently create the strongest weld. If an existing process cannot provide the capabilities needed, it may be necessary to consider another joint geometry to help minimize filler metal consumption. The deposition of the chosen welding process also has a direct impact on filler metal consumption. Deposition efficiency compares the weight of the weld deposit versus the total weight of filler metal used during welding, expressed as a percentage. This figure is important to consider, as not all filler metal will end up as part of the weld. Some can be lost to fumes, spatter, scrap or slag. Different welding processes have drastically different deposition efficiencies. Processes with lower deposition efficiency require more filler metal to be purchased for the same amount of deposited weld than processes with higher deposition efficiency. This leads some companies to convert from stick welding, which generates stub loss and slag, to a wire process like MIG welding. Such processes lower scrap waste and create relatively low levels of spatter and fume, ensuring more of the filler metal goes into the weld joint. When planning welding projects, it's a good idea to consider both pessimistic and optimistic filler metal usages. It's most likely that a real welding environment will require a bit more filler metal than anticipated. Download the Hobart Filler Metal Selector and Calculator App. Need help selecting the right Filler Metal for your application? Give one of our Filler Metal Specialists a call today!